Located in the heart of the Gold Coast, Berkshire by the Sea's Delray Beach location gives you easy access to nearby West Palm Beach and Fort Lauderdale. Just steps away from the beach, the resort puts you in the midst of popular ocean sports, including surfing, windsurfing, and swimming. Enjoy the resort's invigorating saltwater pool and relax in the large Jacuzzi. Take a swim in the freshwater pool or play a game of tennis. Have fun on the shuffle board court or at the putting green. For more information about this relaxing escape, visit www.vrivacations.com. 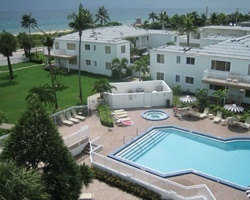 Great resort with easy access to nearby West Palm Beach and Fort Lauderdale! Annual week 32 and 33! Inquire for details!